Amazon.com description: Product Description: TheexplosivegrowthoftheInternetandtheWebhavecreatedanever-growing demand for information systems, and ever-growing challenges for Information Systems Engineering. 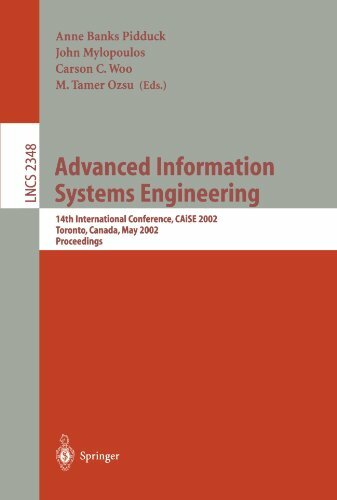 The series of Conferences on Advanced Information S- tems Engineering (CAiSE) was launched in Scandinavia by Janis Bubenko and Arne Solvberg in 1989, became an important European conference, and was held annually in major European sites throughout the 1990s. Now, in its 14th year,CAiSEwasheldforthe?rsttimeoutsideEurope,showcasinginternational researchon information systems and their engineering. Not surprisingly, this year the conference enjoyed unprecedented attention. In total, the conference received 173 paper submissions, the highest number ever for a CAiSE conference. Of those, 42 were accepted as regular papers and 26 as short (poster) papers. In addition, the conference received 12 proposals for workshops of which 8 were approved, while 4 tutorials were selected from 15 submissions. The technical program was put together by an international committee of 81 experts. In total, 505 reviews were submitted, with every member of the committeecontributing.Decisionsonallsubmissionswerereachedataprogram committee meeting in Toronto on January 26-27,2002. Workshop and tutorial proposals were handled separately by committees chaired by Patrick Martin (workshops), and Jarek Gryz and Richard Paige (tutorials). We wish to extend a great âTHANK YOU!â to all members of the program and organizing committees for their volunteer contributions of time and exp- tise. The fact that so many busy (and famous!) people took the trouble to help uswiththeorganizationofthisconferenceandtheformationofitstechnicalp- gram speaks well for the future of CAiSE and the ?eld of Information Systems Engineering. About: TheexplosivegrowthoftheInternetandtheWebhavecreatedanever-growing demand for information systems, and ever-growing challenges for Information Systems Engineering.